To travel is to live. Its been said that the world is a book and those who do not travel only read one page. Traveling is a part of so many lives, whether its for work, fun with the family or the passion to see all the magnificent parts of the world. Are you a traveler? Does your wanderlust keep you itching to jet set any chance you can get? Whether you love to travel or just so happen to be looking for travel riddles, we have the perfect riddles for you. 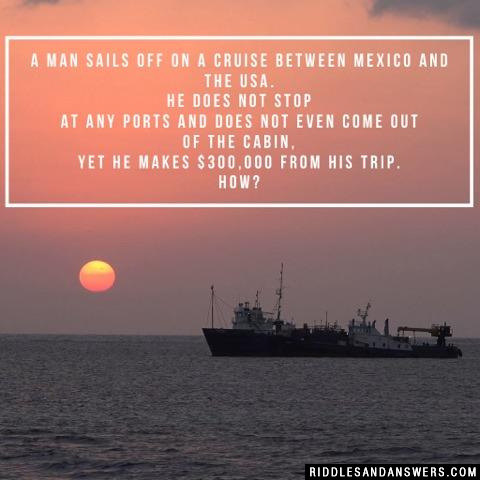 We have every type of travel riddle you can think of including every mode of transportation from airplane riddles, to train riddles and boat riddles. We also have What Am I? 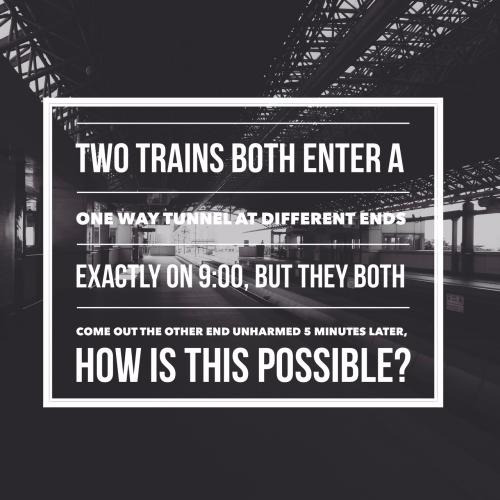 travel riddles and hard trick riddles. On your next layover to your highly anticipated getaway destination, try your riddle solving skills with our travel riddles and answers. A train leaves from Halifax, Nova Scotia heading towards Vancouver, British Columbia at 120 km/h. Three hours later, a train leaves Vancouver heading towards Halifax at 180 km/h. Assume theres exactly 6000 kilometers between Vancouver and Halifax. When they meet, which train is closer to Halifax? 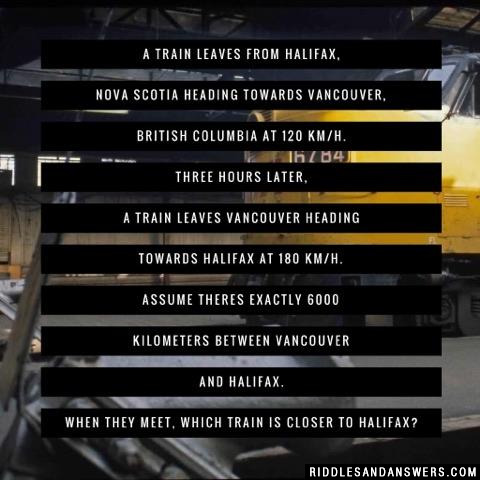 Both trains would be at the same spot when they meet therefore they are both equally close to Halifax. What is the cheapest way to travel? What is the craziest way to travel? While I was going to London I met a men with 7 wives, 7 sacks, 7 kids and 7 cats. How many were going to London? Where do pianists go on vacation? A man and his wife hopped on a plane and flew to Florida. During their vacation, the man was murdered. The police instantly knew who did it and arrested the wife. How did they know who did it? The wife bought her husband a one-way-ticket. Once there was a man and his wife and son. They were out sailing on the ocean when they got ship wrecked on an island. There was little on the island, few coconuts, small amount of clean water, and some pineapple. There were also quite a few pelicans, which the man thought was strange cause there was so little food on the island. Well one day his son died. They were devastated. The man and his wife tried to survive by eating the pineapples and trying to catch a pelican but never could catch one. When the man was close to death his wife had brought him some meat from a pelican that she had caught. He loved it and that saved his life. He was rescued by a helicopter and brought back to his city without his wife cause she had died before. So one day back in the city he went into a bar and he ordered a pelican sandwich to remind him of his wife. He took one bite and he went outside and shot himself. Why did he kill himself? He took one bite of it but it was not the same meat that his wife had given to him on the island. He realized that the meat she had given him on the island was really her dead son. So he went out and killed himself because he couldn't live with himself after he ate his own son. Susy is traveling by ship from south of the equator to the north. She has a nice little cabin with a bathroom, but no window. Sally has no compass nor other instruments. Just the general luggage one brings on board a long cruise. Yet, without leaving her room or talking with anyone, Susy will be able to tell when the ship has crossed the equator. How? Susy can fill the sink and watch it drain. When the water reverses direction when going down the drain, she will know they have crossed the equator. Can you come up with a cool, funny or clever Travel Riddles of your own? Post it below (without the answer) to see if you can stump our users.